Besides finishing up all the quilt tops stacks and waiting, I’ve been working on some permanent samples for the gather here. For classes that repeat every few months, it’s a good idea to have a sample in fabrics that are readily available rather than prints from a few seasons ago. And you can never go wrong with Kona colors. 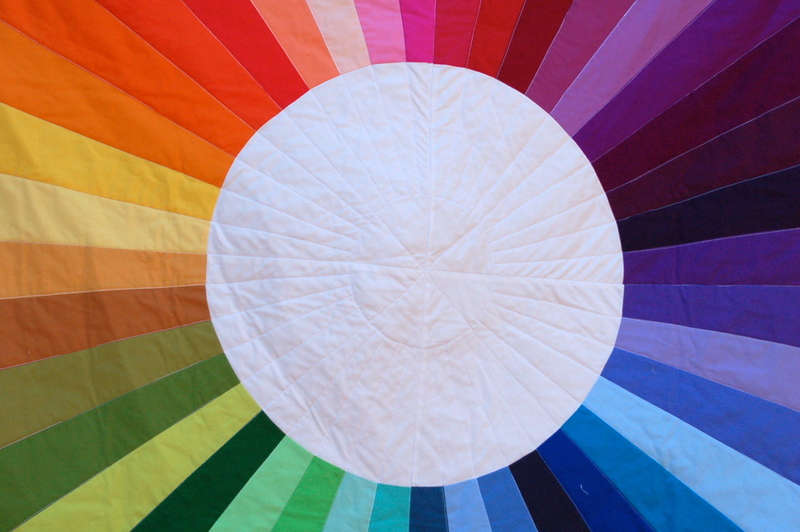 The Color Wheel class is one of my favorite to teach. It always blows people’s minds how easy this is. People come in afraid of sewing curves and walk out feeling confident with an amazing quilt top to show for themselves. I’ll share a little secret here with you: the thing about sewing curves is that you are not sewing in a curve. Your fabric is curved. You’re sewing in a straight line. You’re lining up your raw edges to wherever you need top in order to get a 1/4 inch allowance and just sewing. As long as you don’t stretch, pull, or bunch your fabric, you’re golden. Don’t believe me? Try it. 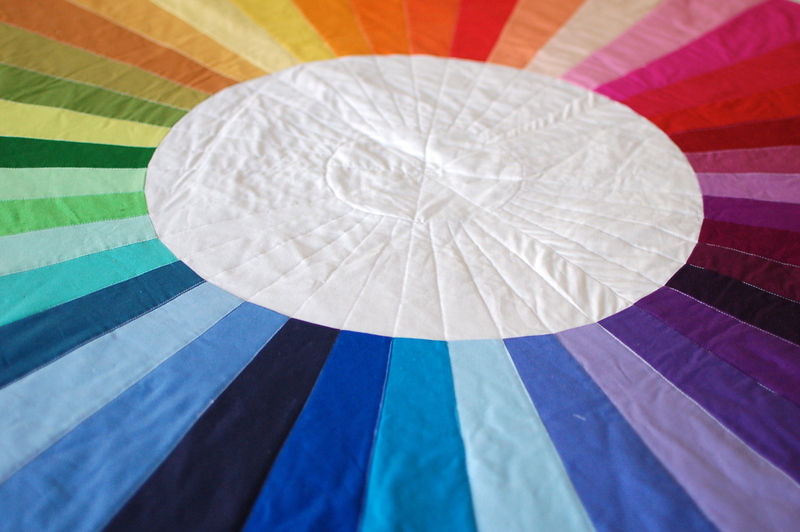 This quilt is particularly satisfying because it comes together so quickly. I think the most time consuming part of the process is cutting the wedges. It’s super-fast and easy from there on out. Gather here now offers fat eighth bundles in these colors so you, too, can whip up your own. Or join us the next time we offer this class. It’s as much fun to teach as it is to make! I leave you with one more “pro-tip:” when photographing your quilt outdoors, choose a day that is not terrifically windy. I had to find a non-windy spot around the corner of the porch, which happened to be the darkest spot in the backyard. Of course! And even then there was lots of flapping and billowing. 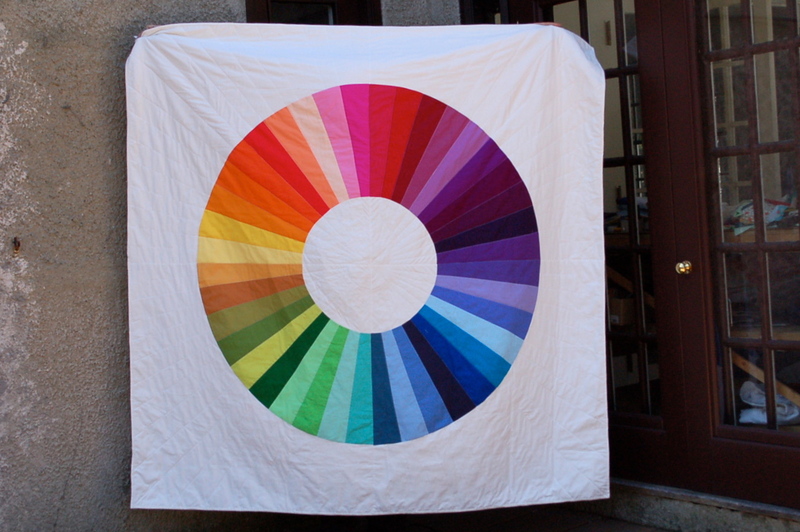 At 71 1/2 x 71 1/2 inches, I needed a hand wrangling this quilt with all that crazy wind.